The likelihood the Rams go through another season like 2016 essentially unscathed along the offensive line — they needed just one half of play from a reserve last year — are slim. Chances are one or all of their rookies will be pressed into duty at some point. And with Brown suspended for the first two games of the regular season after violating the NFL’s substance abuse policy, Noteboom could be a candidate to replace him along with veteran Austin Blythe. But even if they don’t need the rookies this year, the Rams — with their age and finances and the NFL’s hard salary cap — will need one or two new O-line starters to emerge in the very near future. Noteboom appears the surest bet, at least initially. He played both tackle positions and some right guard Saturday against the Raiders, remaining in the game until the end of the third quarter. And he accounted himself quite well, flashing smooth footwork, balance and hands warding off pass rushers, and power and tenacity in run blocking. The Raiders sat most of their starters, so context is important, but just one month and two preseason games into his career, Noteboom continues to flourish even as the Rams thrust him into stressful situations by challenging him to play multiple positions. You don’t play as long as Whitworth has and not know what to look for in a good lineman or how they should carry or conduct themselves. The veteran Pro Bowler has pulled aside Noteboom to point out certain things — what he did well, what he could do better — or to offer tips on an assignment or technique. Noteboom has quietly and appreciatively soaked it all in. You can tell a lot about a guy by not only how he plays, but also how he accepts and processes criticism or advice. And Noteboom has left an impression as a player and a young teammate. “He’s one of those guys that, honestly, he’s got the right character and attitude to be a really good football player,” Whitworth said. As Noteboom was leaving the Coliseum on Saturday, he was already thinking about aspects of his performance to focus on in film study. He’ll narrow it down to two or three specific areas and then work on them in practice. Off the top of his head, he said he wants to get a better command of the playbook so he can play more freely rather than thinking so much. That’s easier said than done when you’re cross-training at three different positions, but as he showed against the Raiders, Noteboom is handling everything the Rams are putting on his plate. In April, left tackle Joseph Noteboom was one of over 400 college prospects eager to make his dreams a reality by becoming a professional athlete. Now eight weeks later, a lot has changed for the TCU product. Not only was he selected by the Rams in the third-round of this year’s draft, but he has also completed his first set of OTAs in the NFL — marking a significant transition for the 22-year old. The three-week session was the left tackle’s first taste of playing in the league, something he says has been “pretty on par from what I thought” heading into it. And although the Rams’ high-speed offense is admittedly more detailed than his college scheme, Noteboom has been fortunate to learn from a talented group of linemen. Last season, the club’s offensive line was ranked among the best in the league and features one of the top tackles in the game in Andrew Whitworth. As he did in 2017, the 13-year veteran has made a point to take the younger players under his wing. But it’s not just the mentorship from the older vets that has surprised the rookie tackle. For Noteboom, one of the most exciting aspects of OTAs was getting to observe and learn from head coach Sean McVay. And now that Noteboom has a feel for both the coaching staff and roster, he is hopeful that during the rest of the offseason his progress will come more steadily. ST. LOUIS — Rams offensive line coach Paul Boudreau expressed his surprise following Monday’s evening practice session that a group of reporters would be interested in speaking with him. “Usually they talk to me after a bad sack day,” Boudreau joked. But the veteran line coach is in the spotlight this training camp as he works to get the Rams’ young and inexperienced group ready for the regular season. Four players who started up front for last season’s regular season opener are no longer with St. Louis. In their place are two rookies in right tackle Rob Havenstein and right guard Jamon Brown, one second-year player in left tackle Greg Robinson and the three players competing for the center spot, Tim Barnes, Barrett Jones and Demetrius Rhaney. 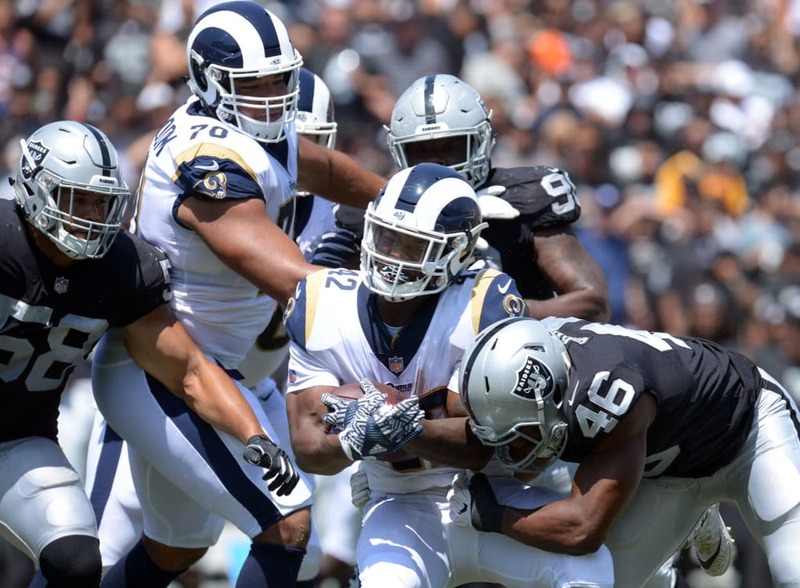 The Rams will open the four-game preseason schedule on the road against the Oakland Raiders on Friday and then head to Oxnard, Ca., to have joint practices with the Dallas Cowboys. Those should help the young Rams — the coach noted that this is the deepest group they’ve had up front — get a good taste of what they are in for this season. But they are also getting good looks every day in practice against defensive coordinator Gregg Williams’ group, which features one of the best defensive lines in the league. Boudreau said the first challenge the youngsters will face when making the transition to the NFL is the speed of the game. He noted that while they may have faced a player the caliber of 2014 No. 1 overall draft pick Jadeveon Clowney in college, they wouldn’t have faced a player like that every single day like they will in the NFL. Three weeks ago, Rams offensive tackle Isaiah Battle held newborn daughter Brooklynn in his arms for the first time. It might be a stretch to say it was a life-changing experience for the rookie from Clemson, but it sure put things in perspective. That “bull” includes Battle getting suspended in 2013 after punching a North Carolina State player. It includes a police citation for marijuana possession after being pulled over for speeding in June. Battle had considered turning pro in January following the end of the 2014 college season. But the latest off-field issue, coupled with the impending birth of his daughter, caused Battle to change his mind over the summer and go into the supplemental draft. Scouts from more than two dozen NFL teams attended Battle’s hastily arranged pro day in early July, and a couple of days later he became the Rams’ first supplemental draft pick since the franchise moved to St. Louis in 1995. The team forfeited a fifth-round draft pick in 2016 to make the selection. “The guy is gifted, physically gifted,” Rams general manager Les Snead said. “He was well on our radar (for the 2016 draft). A little bit last year (too) because there was maybe a chance he might come out last year. Chose not to. The Rams feel Battle, listed at 6 feet 7 and 290 pounds, has starter’s potential. And if they end up getting a starter for a fifth-round pick, well, that’s a bargain. Before entering the supplemental draft, Battle was seen as a potential late first- or second-round prospect for 2016. “Honestly, I heard feedback like that,” he said.